Sellers Keever is a 35 yard outdoor education activity center remembering and honoring Jonathan Sellers and Charlie Keevers who were murdered 19 years ago while they were riding their bikes not too far from the park in Imperial Beach. The San Diego County Parks and Recreation team came to T.B. Penick to start design development on this project. T. B. Penick worked closely with their team to create the appropriate design and materials to honor the two boys and create a learning environment for children that will be utilized by California Fish and Wildlife. 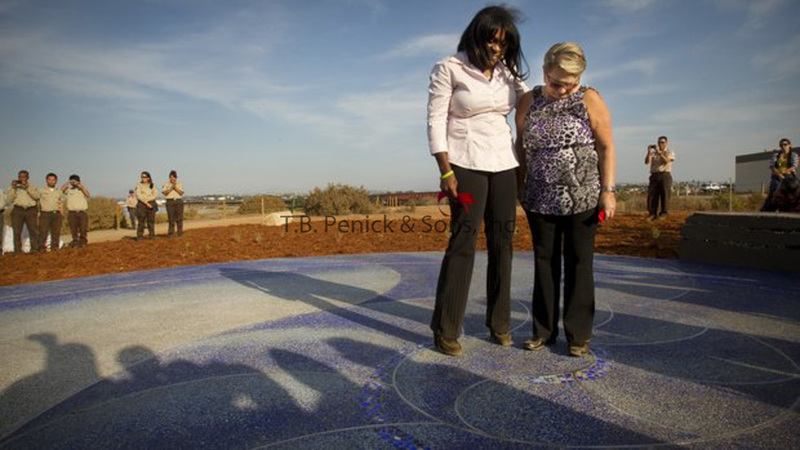 The mothers of the two boys, Milena and Maria worked together with the LithoMosaic artist Amanda Conahan at the T. B. Penick & Sons office to complete the mosaic which includes photos of the boys, glow in the dark tiles and sea glass which is called “tears of the ocean". They chose to do a beach theme and have T.B. Penick create a Lithocrete shell that fades from dark, medium, to a light blue. After laying out the Lithocrete mix carbide was then shot onto the mix. Within the Lithocrete mix features the LithoMosaic piece. Along with the LithoMosaic piece and Lithocrete mix are medal half inch by 2 inch strips that were used to help emphasize the design of the shell. To really make this memorial special glow in the dark tiles were used within the LithoMosaic so that the art work could be enjoyed both during the day and at night, making this piece a very special memorial. Going around the shell features a Sedimentary wall by T.B. Penick creating a beautiful seating area for people to go and enjoy the art work before their feet as well as the view of the water. The park was named the Jonathan Sellers and Charlie Keever Outdoor Education Activity Center. The mothers wanted to have a place to recognize their sons but also give back to the community to provide a place for children to go and learn.